Wrapping up our 2014 we thought we’d bring you a recap of our Top 10 most popular articles for 2014! Which one was your favorite? Stay tuned tomorrow when we’ll be taking a walk down memory lane, and posting a list of our own personal favorites. Many people believe that Disney cruises might not be great for the under-three-crowd. This is mainly due to the fact that the youth programming and pools are reserved for those who are potty trained and, in the case of the kids clubs, over three years old. 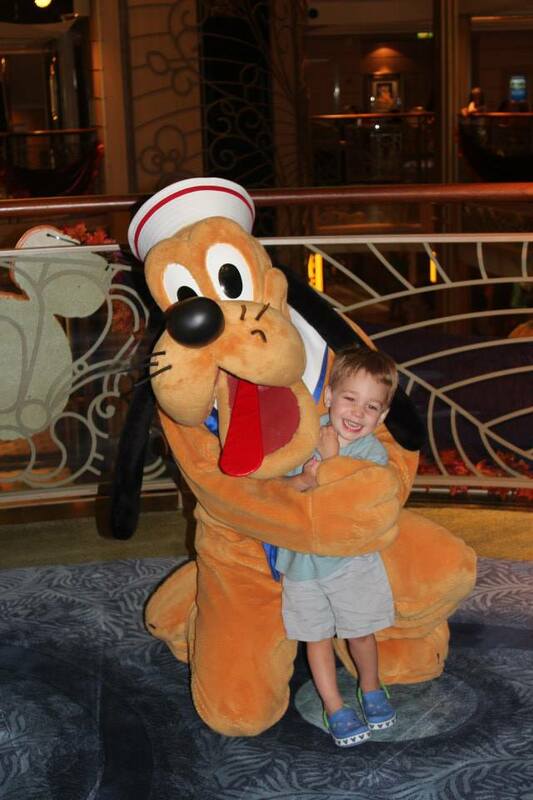 My son has sailed twice on the Disney Cruise Line as a toddler and we have felt there was so much for him to do. 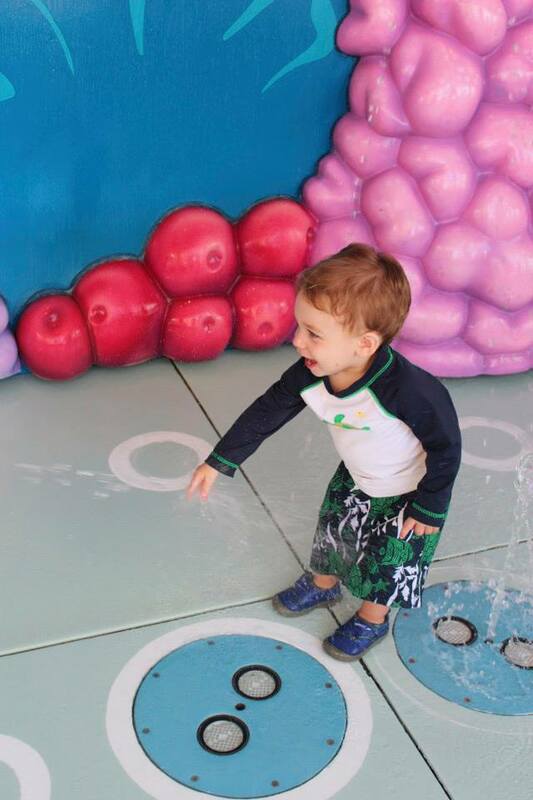 If water play is a big deal for your little one, consider the Dream or the Fantasy because their under 3 water play area is much larger and more interactive than on the Wonder and Magic. On the two newer ships there is a Finding Nemo water play area which has lots of jets and sprayers and a tiny slide. My son loved it. While the kids’ clubs are not available for the under 3 crowd, there is a nursery on-board. We used it for when we wanted to dine in the adult-only restaurants and there is a nominal fee. The crew members were very attentive and took great care of our son. There are some times set aside, called Open House, when anyone can go in and check the Kids Clubs out. 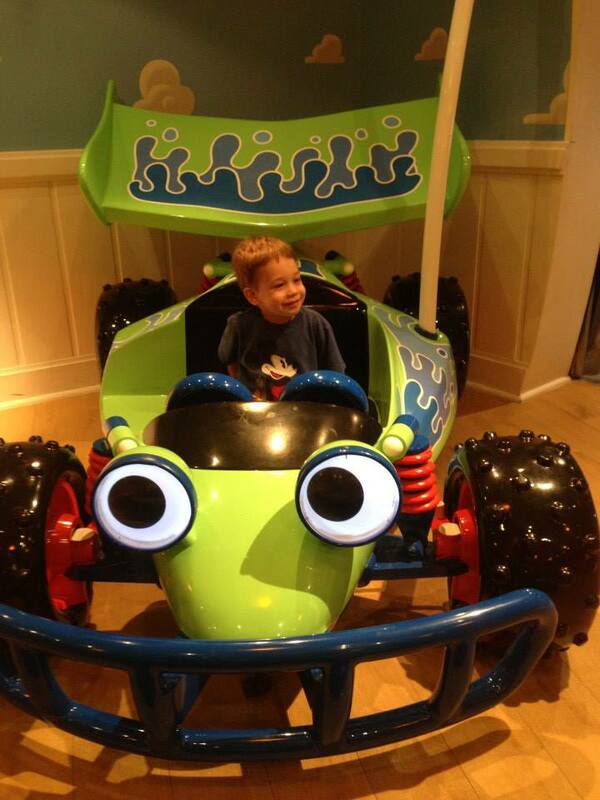 They are usually in the morning, we took our son to the Oceaneer’s Club and he had a blast playing in Andy’s room. As far as filling your time on sea days with a toddler– we found we were never without an activity. There is almost always a character greeting somewhere on the ship. There are also activities in the D-Lounge (Family Club Lounge) for babies and toddlers with a Disney Junior theme. One morning Jake came in to play. There are also free arts and crafts activities usually each sea day. One day we made door hangers and two other days we made memory pages, we really enjoyed these crafts and we had free souvenirs. There is also miniature golf up on the sports deck. What better place for your child’s first game? There is a movie theatre that shows Disney movies throughout the day. We didn’t have a chance to do either of these things, but they were on our list! Dinner time is where you really need to be prepared. Dinners are long and a toddler’s attention span is not long enough to accommodate. We brought along a bag of trains and cars and brought it to dinner every night. 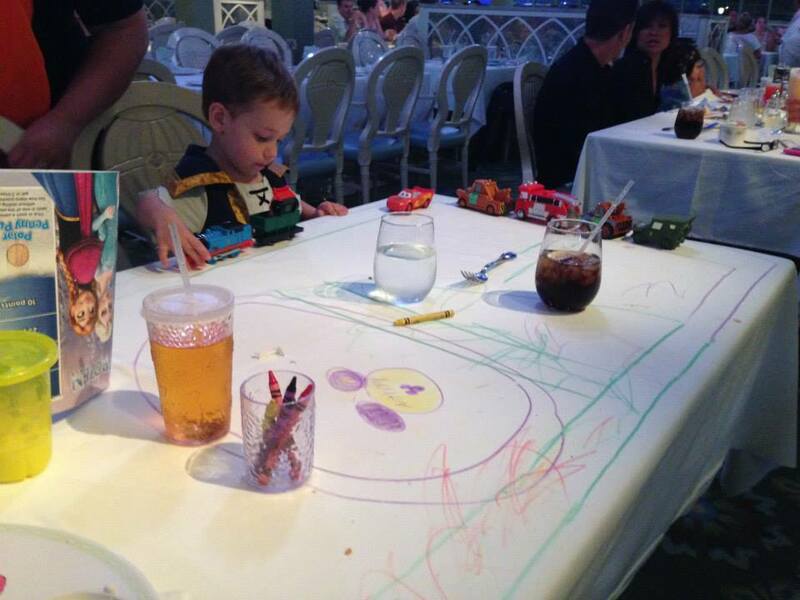 They actually allow you (and encourage you) to draw on the table cloths, a habit I had to break my son of once we were back home, he drew train tracks all around our table and it kept him occupied all throughout the meal. Whatever you child is into, bring that with you. Playing at the table is encouraged and it also keeps you engaged with each other. Try your best to get the early dinner seating, if you do not get it when you book, be sure to request to be put on the wait list. You can also check, when you get on board, if there is availability. The timing is better for the toddlers and then you can either have an early bed time or enjoy the show for the evening. My son really enjoyed the shows, so our nightly routine was: eat dinner, return to the stateroom and give him a bath and have him wear his pajamas to the show. As soon as the show was over we went back to the room for bed. A big tip for excursions: plan easy half-day excursions and go at the time of day that is best for you little one. My son is an early riser, so the morning excursions worked best for us. We did tours and visited the beaches on our Caribbean cruise and it was perfect. 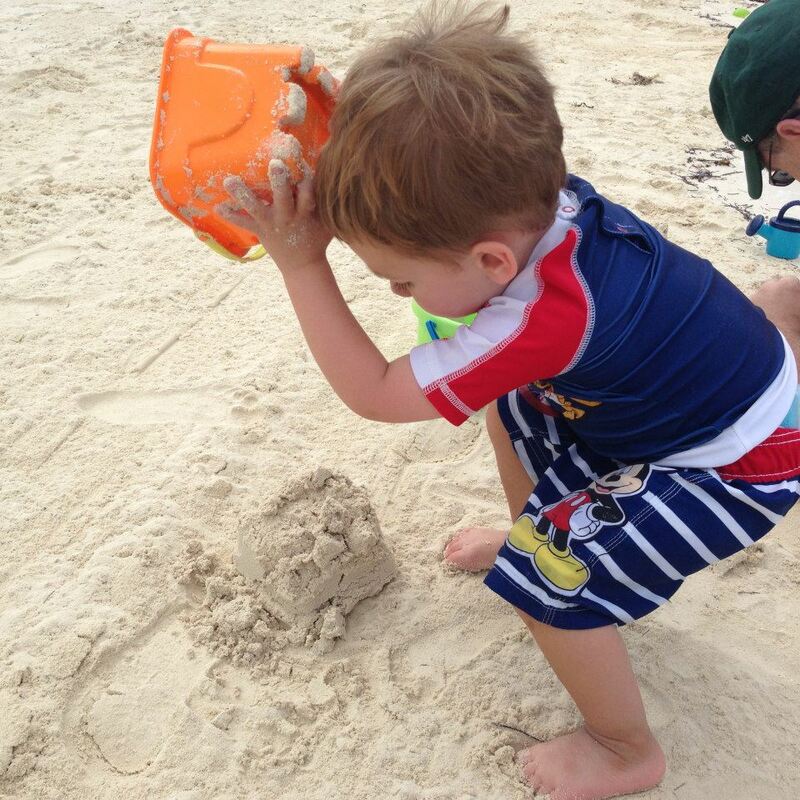 Be sure to pack some sand toys for the ports and Castaway Cay day– your toddler will be so happy and you won’t have to pay for over-priced beach buckets on the boat or island. Cruising with a toddler does require a different strategy and extra planning. You should definitely read your on-board Navigator well and just remember to enjoy the moments with your little one while he or she is still so young– these years never come back! We had our best vacations aboard the “Mickey Boat” (as my son calls it) and can’t wait for our next one. 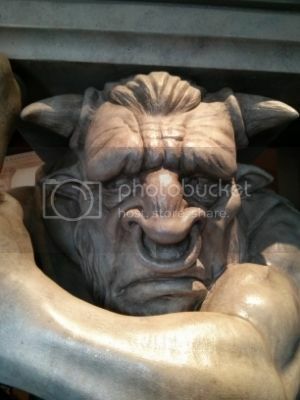 We all have them, pet peeves that seem to only happen at Disney. Sometimes it is hard to keep your cool when you are just going along and someone does something that drives you crazy. My first one, which is easily solvable is the people who stop in the middle of the pathway to look at their phone, park map or something they sighted. This is not only annoying it is also dangerous. The parks are packed with people, strollers, and wheel chairs and trust me when I say you don’t want to get rammed in the back of your ankles or legs with either of those, or be the person who runs into someone who stops suddenly. Of course I don’t blame you for stopping to look but make sure to look around and behind you before you do it and step to the side. Cutting in line, line jumping, whatever you want to call it, it is a big NO! It also can get you removed from the park. We can all understand having a bathroom emergency with little ones but don’t let mom wait in line, then have the whole family come join her as she is about the get on the ride. It is rude and makes the line even longer for other guests. Bad manners are another huge park peeve of mine. When people are rude to each other and to Disney Cast Members. Remember kindness can go a long way and you will catch more flies with honey than with vinegar. We all want a great spot to see fireworks or parades. So, if possible, let the little ones in the front, but don’t crowd out the people who have been waiting for 30 minutes. And be kind to Cast Members, they are just doing their jobs and maybe can make some magic for you if you treat them well. Watch your kids in lines. We know they don’t want to be in the lines any more than you do and they get fidgety and start messing with the chains or barriers. Just watch your children so that they aren’t swinging that chain into other people or constantly bumping into the person behind or in front of them. My method is one adult (or most responsible child) is first in line, another is last, so that all the kids are in the middle and therefore less likely to be bumping into others. And then you can keep your eye on them and keep them from standing or hanging on the rails as you queue up. Take care of your trash. There are trash bins no more than 30 steps from you. Let’s all keep the parks looking nice. I would love to hear what things drive you batty in the parks! What is your park peeve? 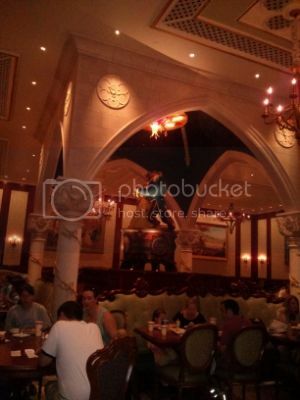 While I was at Disney over Columbus Day weekend, I had the opportunity to try Be Our Guest for lunch. To say I was impressed was an understatement! I had gotten a Fast Pass for a lunch time beginning at 1:45. I showed up and was ushered along to the outdoor check in desk. They checked me in and sent me along the bridge to the restaurant. There was a short line to the register where I paid for my meal. I had pre-ordered my lunch but if I hadn’t, I would have ordered at the register. The cast members there instructed me to find a table anywhere I liked. The restaurant was fairly busy at that time so I ended up choosing a table in the library section. There are three sections to choose from: the ballroom, the west wing, and the library. Each of them are incredibly beautiful and detailed. 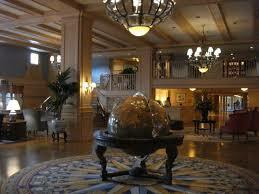 The ballroom is the largest of the three and the west wing is quite dark. The library has beautiful art all over the room. When I found a table, I made my way over to the drink station and got my own soft drink. Even the drink stations are lovely with their granite counter and woodwork. I sat down and waited for my food to arrive. This is the best part! Cast members push rolling carts loaded with food around the restaurant and are guided by a smart phone looking device that uses the Magic Band technology to let the server know where the guest is located. If there’s a better use of current technology out there, I don’t want to know about it! My food arrived and I dug in. 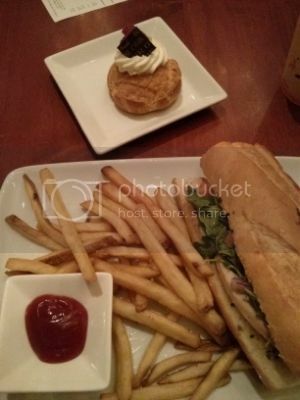 I chose the carved turkey sandwich with pomme frites and the sugar free lemon raspberry cream puff. The sandwich was really good. There was plenty of white meat turkey on a crunchy baguette with a very tasty and light sauce. It was a nice change from the burgers and chicken fingers you might get at a counter service restaurant. The pomme frites were pretty much your standard Disney fries. Good, but not the greatest. 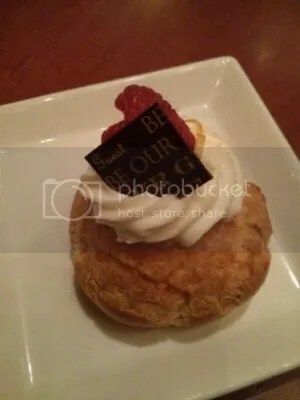 The cream puff was amazing! It was sugar-free but it didn’t taste it at all, and I can usually tell. Overall, my lunch cost somewhere around $18, which is pretty standard for a Disney counter service lunch. All in all, I was very pleased and I encourage everyone to give Be Our Guest a shot for lunch if you have the opportunity. One common misconception I hear often about Disney World is that they only have ‘typical’ theme park food of burgers, chicken nuggets and french fries. While I do happen to believe that the burgers and chicken nuggets at Disney are top-notch, I also understand the desire for something a little bit more sophisticated than those options on occasion. In Part 1 of this 4 part series we check out some great options for counter service meals in the Magic Kingdom! 1) Columbia Harbor House : Located in Liberty Square, I consider Columbia Harbor House to be a hidden gem at the Magic Kingdom. You can find many delicious seafood options here including a lobster roll (for the bargain price of $10.49), clam chowder, fish and chips and more. Another highlight of Columbia Harbor House are the vegetarian options of vegetarian chili and the Lighthouse Sandwich which consists of tomatoes and broccoli cole slaw with hummus on multigrain bread. Even my burger-loving self admits this sandwich is something special! 2) Pinocchio Village Haus : This counter service restaurant in Fantasyland (with a few “it’s a small world” view seats!) is worth visiting for one of their menu items alone. Disney pizza in general is… not very good. The flatbreads at Pinocchio Village Haus are a different story! There are three different varieties of flatbreads: Pepperoni, Caprese and BBQ beef but I personally enjoyed the BBQ beef. Another very popular item here is the meatball sub, which is definitely on my list to try for next time! 3) Casey’s Corner : On Main Street USA, Casey’s Corner is a staple of Magic Kingdom. Yes, they are just hot dogs, but sometimes you just feel like a hot dog! 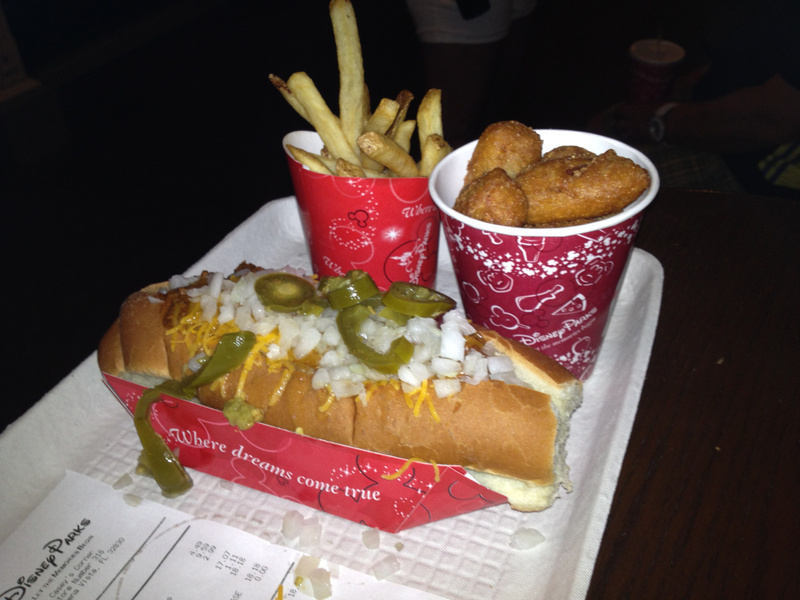 At Casey’s you can get a plain hot dog or go all out and have the Chilli Cheese dog or the Barbeque Slaw dog. I personally prefer the corn dog nuggets for my meal. You can also get Cracker Jacks here! 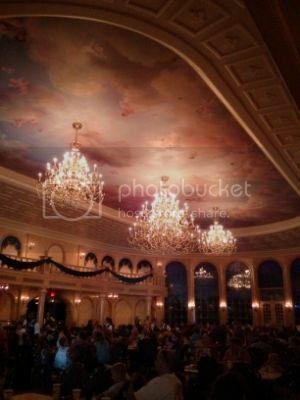 4) Be Our Guest : Be Our Guest is still a very difficult to place to obtain a reservation. If you are lucky enough to grab one, you will have a very good meal. Counter service lunch at Be Our Guest is as close to the quality of a sit down meal as you can get. I have personally tried (and enjoyed!) the Braised Pork and Carved Turkey sandwich, but I have yet to hear any real negative feedback on the menu items served during lunch at Be Our Guest. A major bonus is the setting! Enjoying lunch at Beast’s Castle, there isn’t much better than that! Note: A prior version of this list may have included Pecos Bill’s Tall Tale Inn and Cafe. However my personal opinion is now that they’ve recently removed the taco salad from their menu there are better places to find a meal at the Magic Kingdom! One minor caveat; if you are going to eat a burger at Magic Kingdom the Angus beef burgers are Pecos Bill’s are very good, and the toppings bar allows you to customize to your liking! What are your favorite counter service restaurants at Magic Kingdom? My family and I will soon be sailing on our first Disney Cruise, a 5 night Western Caribbean on the Disney Wonder. We have previously cruised before on a Carnival Cruise so this is still a somewhat new experience for all of us. As a Travel Agent who specializes in Disney vacations, I am a certified graduate of the Disney College of Knowledge. The courses are informative and I have studied the Disney Cruise Line, but nothing beats first hand experience. I love to travel, but cruising wasn’t really on my radar. My first concern was for my family and how they would react to the motion of the ocean, would we get seasick? The next, is there enough to do on a cruise, you are essentially stuck for a few days. And lastly, safety. The media will never pass up a story about a ship without power or damages and even personal tragedies. I don’t believe all these worries are uncommon for many travelers, but we decided to try it out anyway. I am happy to report that after our first cruise we had none of these issues and ended up having a FANTASTIC time! So almost a year later we were ready to go again! On our previous cruise we did a 5 night Bahamian and wanted to do something different. As I said we are doing another 5 night with stops at Cozumel, Mexico and Castaway Cay (Disney’s private island). So far we haven’t booked an excursion for Cozumel for a few reasons. The first is that we are traveling with a 5-year-old and there are a number of excursions that have age requirements. In some ports children can be left in the kids clubs so that is an option if your child is still young. But I love to travel to see new places and try new things and I want that for my child as well. We are not into snorkeling and prefer to make our beach day the day we are at Castaway Cay so those are out as well. One thing that interests me the most is visiting San Gervasio; a Mayan archeological site, being a historian it is high on my list. Also, being a big fan of Mexican food, my other plan is to get an authentic lunch. 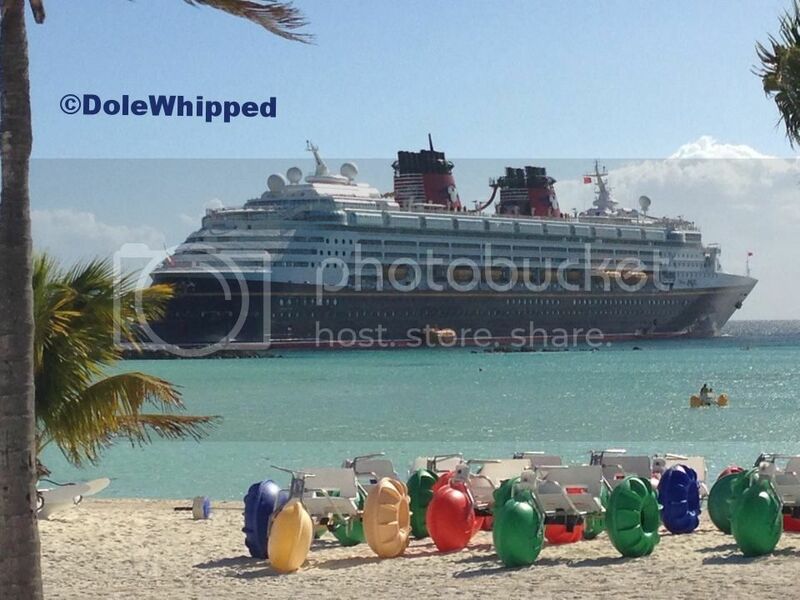 Our other day off-ship is at Castaway Cay. I have a feeling this will probably be our family favorite. On our previous cruise we stopped at Little Stirrup Cay and we loved having the beach day, especially coming from Michigan in December! Castaway Cay is so much better, as well, with kids activities and play areas, adult only beaches, and bike rentals. My plan for this day is low-key: play on the beach and have some fun! On our cruise we have two sea days plus our departure day, I am sure that we will spend plenty of time exploring the ship, swimming, watching shows and movies, meeting characters and of course playing in the kids club. Since we are going before Christmas we will have a Christmas Ball and a chance to meet Santa! Another thing I had to do was make a reservation for dinner at Palo for my husband and I. Since I have heard so much about it and I had such a hard time choosing between brunch and dinner but since I decided to count it as a date night I decided on dinner. But I’m not ruling out brunch either just so I can compare for myself. I am so excited to try cruising with the Disney difference and of course will be sharing my experience here with all of you here at Dole Whipped! 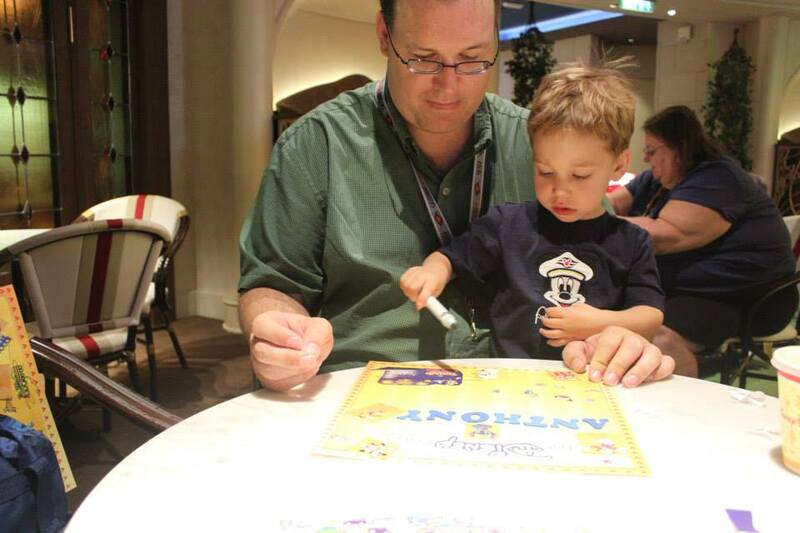 Jillian took a cruise aboard the Disney Wonder and she tells us all about this week! We hear about how her daughter liked the kids clubs, her amazing Palo dinner, what she thought of the Broadway style shows, and more! The entire Dole Whipped team wishes everyone a Happy Holidays! We’ll be quiet next week on the podcast front as we spend time with our friends and families, but stay tuned and we’ll be back soon! I checked into the Yacht Club during the mid-morning hours and though there was a line they did send out a Cast Member to start those waiting on thinking which room they would want. She had an iPad type app that showed available rooms per category. So we got to pick based on that and we picked the best location we have ever had which was second floor right off the open lobby mezzanine. It was awesome because there is a staircase to run up and down from the lobby and the café and you only had to wait on the elevator when you were so tired there was no more running the stairs left in you! So we checked our bags and got our magic bands activated because we had no time to waste seeing the room as we had ADR’s and FastPass+’s to get too. I mention this because one con of this trip was at the end of our long first day when we went to our room for the first time the magic band would not work though it had been promised that it was working. So we got to use those stairs and go up and down and wait as they figured out why…it took a good 20 minutes but finally we were in our room. masculine. Lots of ships and anchors and Captains, etc. 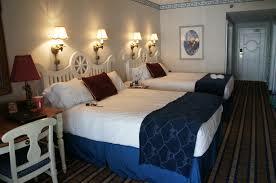 to be found throughout the resort and in the rooms but the beds were comfy and the rooms were first class. In the middle of the lobby during the day stands the Yacht Club’s Captain, a real cast member dressed as a ship’s captain that is there during the day as an information beacon. On our first wake up morning we went to the lobby and were looking for coffee and a bagel type place so I walked up to the captain and asked him “Do you work here?” which I am sure he hears 100 times per day but he still thought it funny and pointed across the lobby to the small bar area that has coffee and croissants in the morning. The best thing about The Yacht Club for me is the location. You are walking distance to Epcot (and some crazy people walk to Hollywood Studios as well) but for us we boat ride over to DHS and it is worth it to save the feet the 20 minute walk! But you can walk quickly into the International Gateway to Epcot and be in France within a few minutes or take the boat if you are not in a hurry. 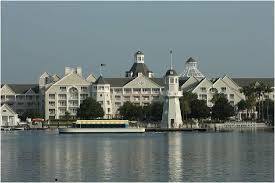 What do kids think is the best part about staying at The Yacht Club? 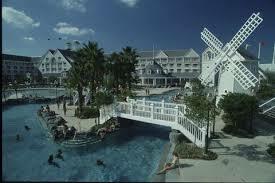 That is hands down Stormalong Bay, the massive pool area and lazy river The Yacht Club shares with The Beach Club. Also, dining is shared between the two with two of my favorites being able to get too quickly – Beaches n Cream (the best burgers and ice cream in WDW) and The Yachtsman Steakhouse which is a wonderful, upscale steakhouse. Would I go back to The Yacht Club? Yes! I have heard from others that some of their rooms are needing some additional TLC as well and I think that we must have been lucky because our room had recently been renovated. But, I loved the locale and all that it offered so next time you are thinking to stay somewhere around the Boardwalk area take a look at the Yacht Club…you will not be disappointed. We are taking my son to Disney World in January and we haven’t told him yet. I decided it would be fun to surprise him on Christmas morning. 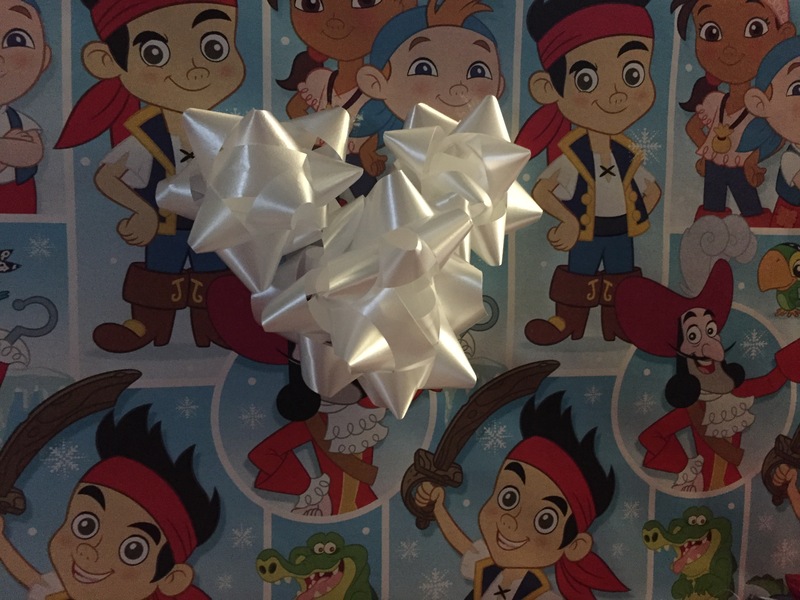 So how, exactly, do you surprise your child on Christmas morning with a trip to Walt Disney World? I decided to wrap items all up in a box and let him discover what’s in store. The first thing I put into the box was a countdown calendar. With a preschooler, I knew I needed a simple count down. 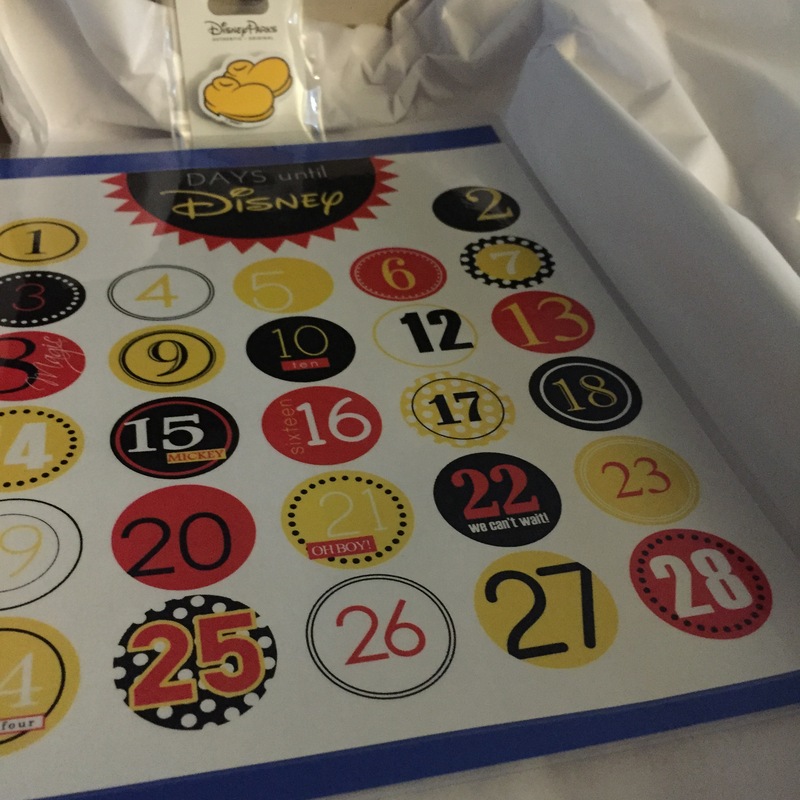 I went to Pinterest, typed in “Disney countdown calendar printable” and this was one of the first ones that popped up. I printed it out, matted, and laminated it. I’m going to have him mark the days with the Mickey shoes post-it notes. Next thing in his box are stickers and an activity book for the plane ride and his autograph book. 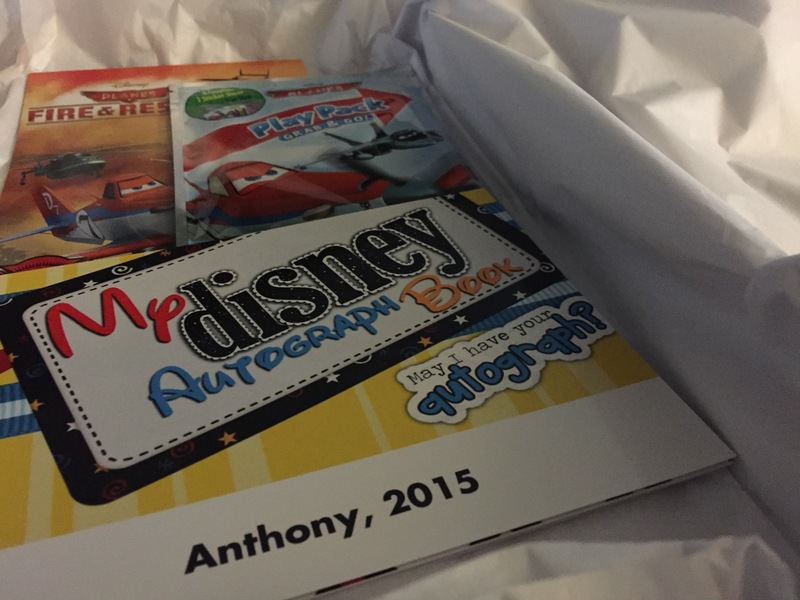 My son is no stranger to Disney characters and he absolutely loves collecting autographs from them. I made the autograph book for him and personalized it to our character meals and Fastpass+ schedule. 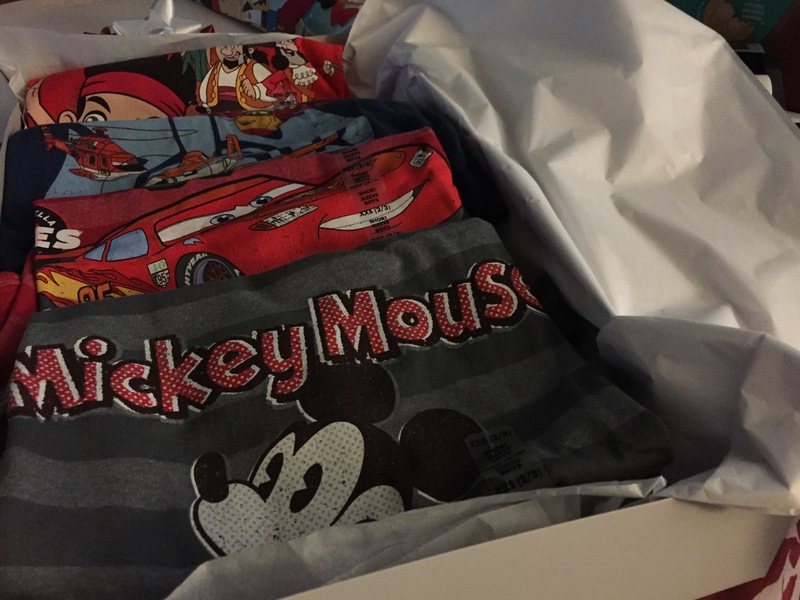 The last items I placed in his box were new Disney shirts I ordered from the Disney Store’s website. I always wait for clearance sales and discounts to stock up on new park attire. I am so excited for this trip and I can’t wait to share in his excitement as we do the final countdown!